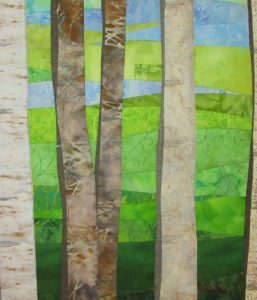 I’ve created about 30 different art quilts with trees, some birch but many just brown/grey trees. In some of my earlier quilts I would try to quilt each tree in the quilt differently. THAT became a challenge I couldn’t maintain and I wasn’t sure it was necessary for the artistic quality of the quilt. 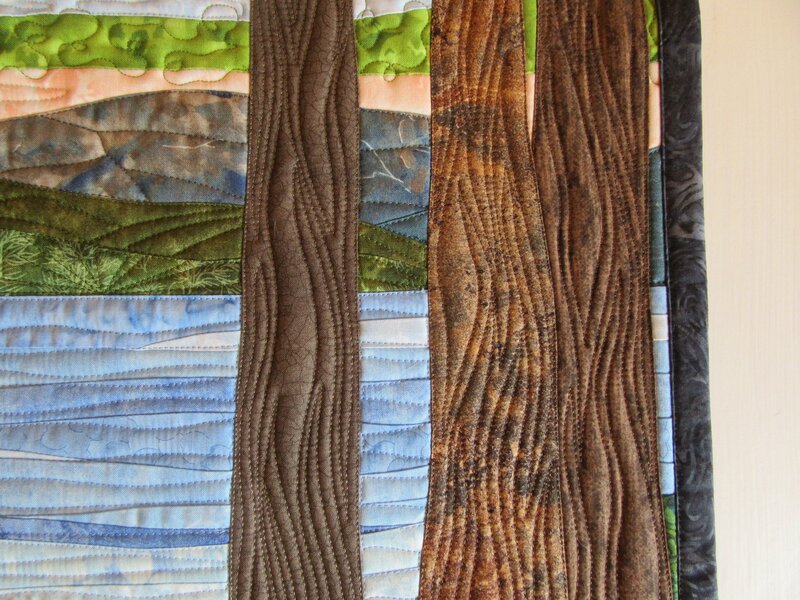 As with any other free motion designs in landscape quilts, think about how to stitch so as to highlight the landscape or in this case, the tree. How can you stitch to mimic bark even in an abstract quilt as mine are? 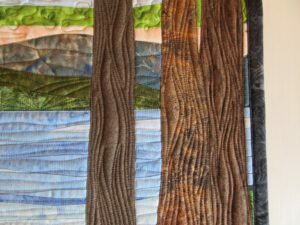 As trees get further into the background in a landscape art quilt, the detail disappears so I often do less distinguishable quilting on background trees, often just simple random curved lines from top to bottom. Sometimes the design of the fabric gives you a clue to a creative way to quilt stitch. 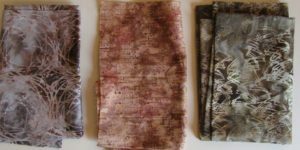 I’ve attached a photo of three fabrics I sometimes use for Birch Trees (remember…abstract and creative!) which differ significantly from the realistic beige/cream color of real birch or aspen trees. These fabrics have color patterns that move differently than up and down so I would choose to stitch on the designs for something a bit different. 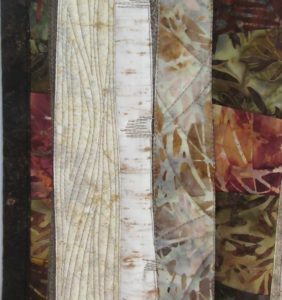 In the top photos for this blog you can see three birch trees in different fabrics and quilted very differently. 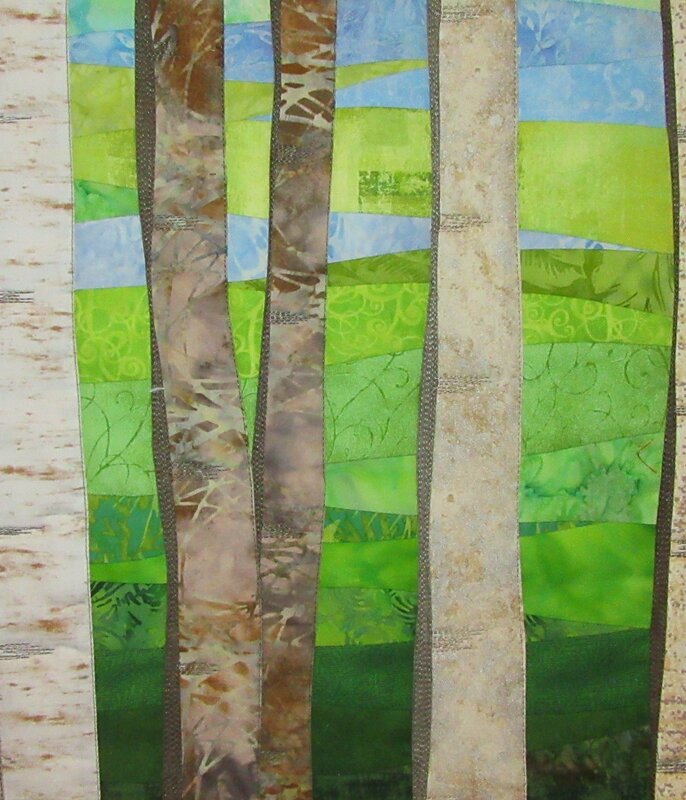 Sometime I do all the birch trees in a similar quilt stitching design because that is the effect I’m after in the quilt. There is a picture included of Birch Trees in Spring which shows how that design works. Let your creative ideas lead you to different designs. For the regular brown/grey trees I use a couple of different designs. One I use is a wavy flame-like design, sometimes with echoing in the design and sometimes with just curvy flame designs which nest from top to bottom of the tree and create a bark like texture. I always leave some open spaces as that is what you see on trees…nothing is consistent or fully lined in bark so do whatever you like. Another design I use is to sew one curvy line from top to bottom, curving from bottom left to the middle right and back to center of left at the top, sort of dividing the tree into a few different sections. Within each of those sections I sew a kind of outside to inside echoing pattern. Sometimes I start out with one design and get a bit distracted and find myself doing another design! The great thing is that it all works just fine! The last photo I’ve included is larger than the others and it is the back of a quilt in which I did a wide variety of free motion stitch designs on about 18 different trees. It is a good sampler you can refer to for ideas.